Week 2 | Whole Food. Real Food. Good Food. Week 2 (kids did not participate): We incorporated Spirulina and Chlorella into our daily regime. The best vitamins and minerals come from real, natural, whole food. The most nutrient dense foods are plant foods, especially organic fruits and vegetables in their raw form. Our body deals best with vitamins and minerals that come from, and in their whole food form. Most of today’s multivitamins come from synthetic sources, with numerous artificial additives like colors, flavors, sugars, chemicals and fillers. It seems like a backward approach to use something that takes away from our health, to improve our health. Chlorella and Spirulina are both algae-related foods high in foliate, a number of vitamins, minerals, protein and amino acids. Their chlorophyll content offers healing properties but have different results. The combination of Spirulina and Chlorella complement each other, providing everything you need to sustain optimal health. The wide spectrum of ingredients including vitamins, fiber, minerals, antioxidants, fatty acids, amino acids, protein, and nucleotides should fill in any gaps you have in your diet. Spirulina aids with muscle building, weight loss, and treats certain types of cancer. Chlorella contains many of the same nutrients and works as an antioxidant. It can be used to cleanse the body. It is also used to rebuild nerve damage in the brain. They work best together. 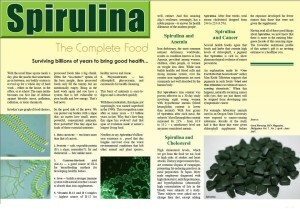 Spirulina prepares the body for body building and increased health. Chlorella cleanses the body. Spirulina is a type of blue-green algae that is rich in protein, vitamins, minerals, carotenoids and antioxidants that can help protect cells from damage. It is considered one of nature’s most perfect foods because it performs such a broad spectrum of activities in the body. Its nutritional profile shows it can replace many more expensive supplements, and its research profile reveals its dedication to promoting good health. Several animal studies have documented the ability of spirulina to arrest the development of cancer progression, reduce risk of cancer initiation, and boost the immune system. Spirulina has anti-viral and anti-allergic effects, and is a natural antihistamine. Recently, spirulina has been found to be effective at lowering the immune response when it has become overactive, a function that may make it effective against autoimmune diseases such as multiple sclerosis. Spirulina contains a high amount of protein, vitamins, and minerals and is known to increase energy. It is about 60-70% protein, which is greater gram for gram than both red meat and soy. It also contains all of the essential amino acids, which makes it a complete protein; this is not very common in plant foods. Spirulina is very rich in iron, which is the most common mineral deficiency. Spirulina also contains calcium, magnesium, and Vitamins A, B, C, D and E. Due to its ability to withstand high temperatures, it is able to retain its nutritional value during processing and shelf storage. Many other plant foods will deteriorate at these temperatures. It only contains 3.9 calories per gram and still has all of these great benefits. It is a low calorie, nutrient dense food. ~ Information provided by http://www.naturalnews.com. Before buying any kind of Spirulina, make sure that it is certified as organically grown. This basically means that no chemicals or fertilizers were used in the production of the algae. Since Spirulina absorbs so much from its surrounding environment, it is good to make sure nothing synthetic and harmful was used in its growth. (Source) We use Healthforce Vitamineral Green V5.2, Powder. Vibrant Health Green Vibrance is also a good source of Spirulinia. See my recipe for the Vitamineral Smoothie to help incorporate Spirulina and other alkaline therapeutic whole foods into your everyday diet. Chlorella is a single cell, freshwater green micro-algae with the ability to bring your body to peak, balanced condition and is recognized as the most nutritionally-potent wholefood on planet earth. It is sodium-free, lactose free, gluten free, and contains no fillers, binders, preservatives, colorings or flow agents. Chlorella is the most abundant natural source of chlorophyll, with more RNA/DNA nucleic acids than any other known source. It is the ultimate liver-enhancing supplement loaded with naturally occurring vitamins, amino acids and minerals. It is 60% protein and naturally contains 19 amino acids (including all essential amino acids). It is also a rich source of over 20 vitamins and minerals including iron, calcium, potassium, magnesium, phosphorus, plus beta-carotene, vitamins B1, B-2, B-3, B-5, B-6, B-12, biotin, inositol, folic acid, vitamins C, E and K. Chlorella has a proven ability to assist the body in detoxifying harmful air, water, and food-borne heavy metal and chemical pollutants, precursors to many of today’s common degenerative disease conditions. Most Chorella users experience increased energy, mental clarity, complexion, and a decrease in stress-induced tension and anxiety. Chlorella and spirulina can be taken at the same time up to the recommended total daily amount. It is suggested that you take each one of them separately at the beginning and then gradually combine them after a period of 1 or 2 weeks. If you take the full amount once a day, it is recommend to take it at breakfast. Alternatively, the daily intake can be consumed at several intervals throughout the day with water or juices, but best times are around 1/2 hour before meals. Light sleepers may avoid taking them too late in the evening due to their energising effects. Some nutrition specialists recommend that you refrain from taking your supplements one day a week. We experienced a noticeable improvement in our energy levels after 1 month of regular and consistent consumption, but then there are others who may take longer before they sense the benefits.